Personal well-being is important, which is a reason why the best fitness trackers remain popular with physically active people. However, one doesn’t necessarily need a fitness tracker in order to measure overall mobility and health. In fact, most Android and iOS smartphones come equipped with the proper sensors and pre-installed app(s) that allow you to count steps, calculate total distance walked, estimate calories burned, set daily/weekly goals, and more. If you peruse the list of specifications for your smartphone, you should notice that it features an accelerometer and a 3-axis gyroscope. The accelerometer senses directional movement, and the gyroscope senses orientation and rotation. 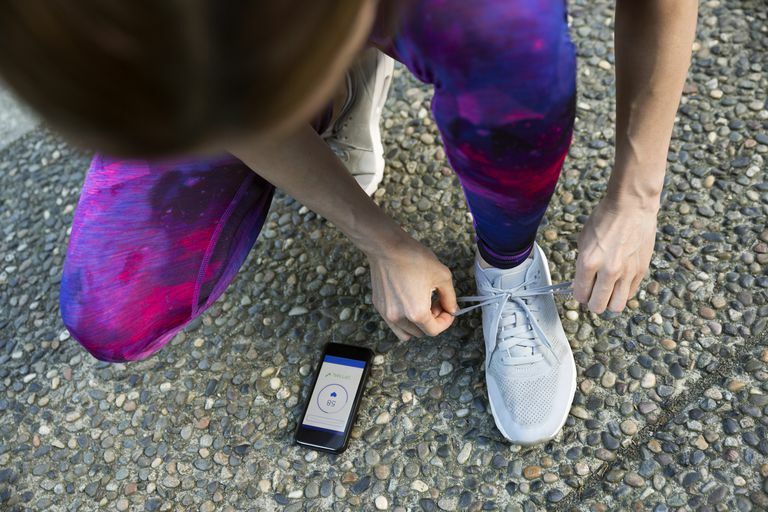 That’s pretty much the only hardware required for tracking steps/movement – the vast majority of fitness trackers use those same two types of sensors. Newer smartphones also feature a barometer, which evaluates altitude (helps to track that you went up/down a flight of stairs or cycled up/down a hill). Most fitness trackers also have a companion app that aggregates recorded info and displays all the stats; this app needs to be installed on your mobile device. So if you will be using your smartphone either way and if your smartphone already has suitable technology and software to count steps, then why hassle with a separate tracking device at all? In many instances, a smartphone can be as accurate as fitness bands and pedometers. And if you’re attached to the idea of wearables, merely purchase a fitness armband or hip holster/case for your smartphone. Android users should expect to find either the Google Fit or Samsung Health app pre-installed on their smartphone. The former is universal, while the latter is particular to Samsung devices. If you don’t have either, they can be downloaded from Google Play. Both of these apps are feature-filled and regularly updated, which makes them excellent choices. To get started, tap the launcher button on your smartphone, scroll through the list of apps on your device, and then tap whichever tracking app you want to use. You’ll be prompted to enter in some personal details, such as height, weight, age, gender, and activity levels. This information helps the software crunch data more accurately. Although the sensors work to measure steps/movement, it’s your height that helps the app determine the distance covered by each step. The steps/distance, combined with your personal details, is how the app estimates total calories burned through activity. You will also be prompted to set (can be edited later on) activity goals, which can be a target number of steps, calories burned, distance covered, total activity time, or a combination of those. You can view your progression of tracked activity over time through charts/graphs displayed by the app. Steps, calories, distance, and time are all recorded automatically; weight would need to be entered manually to be tracked by the app. It’s a good idea to spend a few minutes exploring the app and its settings in order to familiarize with the interface, options, and additional features. Once you’re ready, test it out by taking a short walk! If your Android device doesn’t have Google Fit or Samsung Health, or if you merely want to try a different app, there are plenty to choose from. Major differences between apps are ease of use, visual layout, connectivity, how data is presented to the user, and so forth. C25K Running Trainer: Ready to step up your game? C25K by Zen Labs Fitness can help train you to successfully finish a 5K run. The app is easy to use (ideal for first-time runners) and offers a mix of programs that help gradually build strength and stamina over time. Want a full body workout/ Zen Labs Fitness has apps to train situps, pushups, pull-ups, and squats. Map My Walk: If you want to start with the basics and move up from there, Map My Walk is a great choice. With GPS enabled, you can track and view your route (and full stats) in real time, complete with customizable voice feedback. You can save/share your favorite paths as well as look for local ones to try out. Pedometer & Weight Loss Coach: If your goals for walking also include losing weight, this app can help. In addition to tracking activity, Pacer Health's Pedometer & Weight Loss Coach lets you input weight and BMI, allowing you to correlate health/body changes with activity. Social connectivity helps to keep you motivated, no matter the goals. iOS users should expect to find the Apple Health app pre-installed on their iPhone. As with the aforementioned apps found on Android devices, Apple Health lets users monitor activities, set goals, and food/water intake. To get started with Apple Health, scroll through your device’s home screen and then tap on the icon to launch the app. As with other fitness/health apps, Apple Health will prompt you to input personal details. Your height helps the software more accurately calculate distance traveled by steps/activity. Your weight, age, and gender help to calculate the total calories burned based on the recorded distance/activity. You will also be prompted to edit your personal profile (e.g. body measurements), select/display health statistics important to you, and add additional categories that you want the app to track. The Apple Health app acts like a hub, so it will recommend downloading different apps based on the activities you wish to the (e.g. running apps for those who want to run, cycling apps for those who ride bicycles, etc). All your progress over time can be viewed through charts/graphs. The Apple Health app goes above and beyond other fitness/health apps in some aspects. You can manually enter health data, import and view health records, sync with a variety of connected devices (e.g. sleep monitors, wireless body scales, fitness trackers, etc), and more. Apple Health can seem a little intimidating at first, given the depth of settings and features. So it’s recommended to spend some time familiarizing with the layout and configuring the dashboard. Once you’re ready, test it out by taking a short walk! If Apple Health seems a bit much for your tastes, there are plenty of simpler alternatives out there. Most of the differences from one app to another will be topical (e.g.pull-ups visual layout of data, interface, options, etc). Pacer Pedometer Plus Weight Loss and BMI Tracker: Pacer works entirely from your smartphone without any extra setup or login steps required. Not only does it track activity, steps, distance, and calories, but you can also input your weight and BMI. Set and maintain goals to stay fit and shed excess pounds. Activity Tracker Step Counter & Pedometer: If you want core features without unnecessary frills, this app is for you. Activity Tracker, by Bits&Coffee, tracks all your daily activity and displays the results in colorful, easy to read graphs. The app promises low battery usage so your iPhone can last all day. Argus Calorie Counter, Diet, Activity Step Tracker: Those who want to dive in deep and quantify all aspects of health can do so with this app by Azumio Inc. Argus tracks a variety of activities, but it also lets users count calories with its built-in food database. Combined with personalized weight loss plans and workouts, look forward to a fitter, healthier you. Useful as your smartphone can be, there are times when it may not meet needs like a dedicated step counter or fitness tracker would. For instance, if you happen to leave your smartphone at your work desk, it wouldn’t know that you walked down the hall and up a flight of stairs and back to use the restroom. A step counter would have recorded all that from the wrist or hip because you'd literally be wearing it all day. Any significant amount of physical activity is worthwhile, even if smartphones or fitness wearables aren’t capable of perfect accuracy. If you are focused on maintaining personal well-being, there are many health benefits that come about from walking. You already own a smartphone, which has everything you need to get started. And when you’re ready to pick up the pace, you can always check out the top running apps for Android and running apps for iOS.